Remember in the last post when I mentioned a little something about this? Yep! This is one fantastic giveaway! 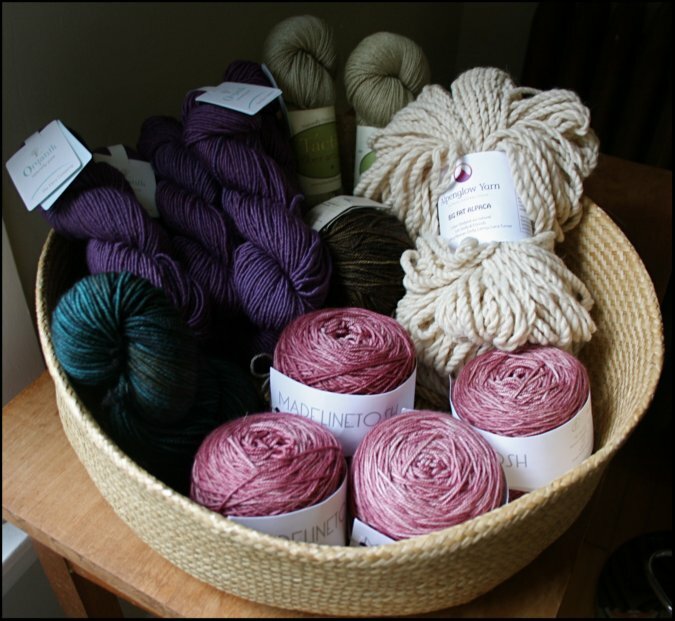 Everyone who pre-orders a copy of Coastal Knits is automatically entered to win this fabulous basket of yarn! 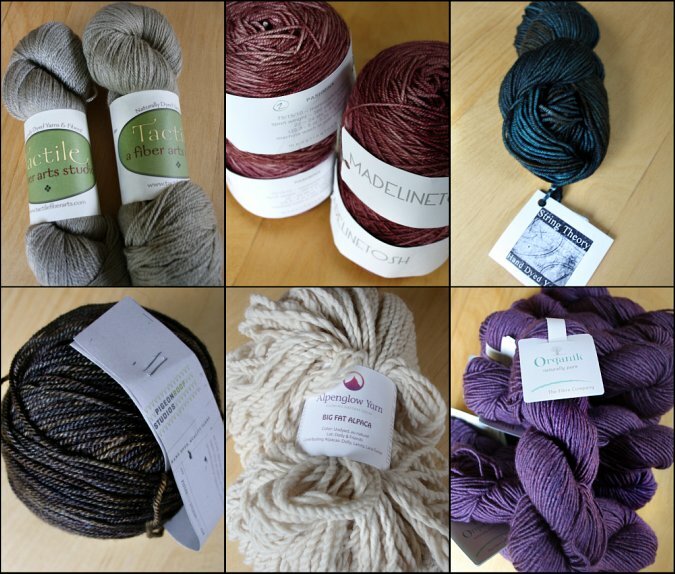 All of these yarns were hand selected by us for use in our Coastal Knits projects! -2 skeins of Tactile Fiber Arts Wild Crafted series skeins dyed in eucalyptus leaves. This is enough to knit 2 or more Rustling Leaves Berets. -4 skeins of Madelinetosh Pashmina in Isadora. This will make the smallest size of the Wildflower Cardigan. -1 skein of String Theory Hand Dyed Yarn Caper Aran in Skerry. This is the yarn Hannah used in her Water's Edge Cardigan. -1 skein of Pigeonroof Studios Cassiopeia DK in Bronze Age. This is the yarn used in my Gnarled Oak Cardigan. -2 skeins of Alpenglow Yarn Big Fat Alpaca. This is enough to knit a Cambrian Cowl. -10 skeins of The Fibre Company Organik in Heather Moorland. This is enough to knit the two smallest sizes of the Rocky Coast Cardigan. I know that this basket is going to make one of you knitters very happy! We hope that you enjoy our new book, Coastal Knits, along with these amazing yarns we've chosen to work with! Remember.. to enter the drawing, pre-order your copy of Coastal Knits HERE on our website! Thank you to everyone who has pre-ordered thus far! We really appreciate your enthusiasm and support!